Judging by the depth of that shadow mask, John Hale is Batman AND Zorro. There's not much to say about the card itself, so let's look at the uniform. By the mid-1970s, most pro teams wore synthetic (and economical) pants and jerseys, as betrayed by the elastic triple-stripe on John Hale's waist and inseam. Some teams kept belts and other traditional details in the mix, but many minor leagues saved on sewing and laundry costs with simple two-piece outfits. Pitcher and author Dirk Hayhurst (The Bullpen Gospels) noted this skinflint practice lives on into the 21st century, as minor league players scramble to find pants and stirrup socks that fit from the limited stock many teams provide. 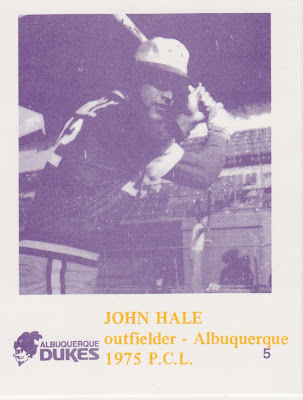 As LA's AAA affiliate, Albuquerque sent several guys onto future major league careers (in bold) and the "young me" remembers both John Hale and Joe Simpson from their years with Seattle. Hale logged a career-high 107 games for the 1978 Mariners but posted just a 56 OPS+, mostly appearing as a defensive replacement by the second half (career stats). This Caruso-printed set includes 20 of his teammates. 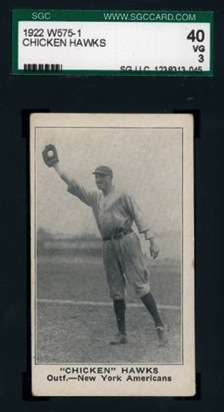 BONUS: To make up for John Hale being so occluded, here's 1921 Yankees outfielder Chicken Hawks. Look at those blousing wool pants and feel the pooling knee sweat. Ugh. Value: This #5 cost $3 at MinorLeagueSingles.com. Team sets are scarce, but should be affordable for lack of major league stars. Fakes / reprints: It'd be easy to fake with existing equipment, but haven't seen any in the marketplace.